Hailed as the “Camp of Dreams” by Live Magazine at the start, Camp Broadway will present its 25th summer camp in New York City in 2019. We will also mark the 20th anniversary of our annual national tour which launched at great theatres in Atlanta, Buffalo, Providence and Tempe. Camp Broadway began in a studio with 18 children in 1995. Since then, we’ve hosted over 40,000 children at camp or special events and more than 420,000 students at educational workshops. Over the years, the company has emerged as a leader in presenting musical theatre programs that kids love, parents’ trust and teachers respect for high quality arts enrichment programming. 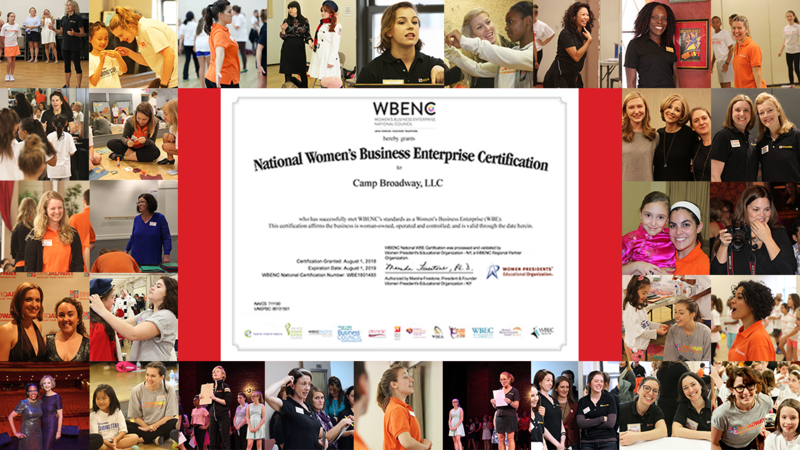 Camp Broadway is proud to announce that we have obtained national certification as a Women’s Business Enterprise (WBE) by the Women Presidents’ Educational Organization, the Northeast regional certifying partner, of the Women’s Business Enterprise National Council (WBENC), for being a company that is owned, managed and controlled by one or more women. 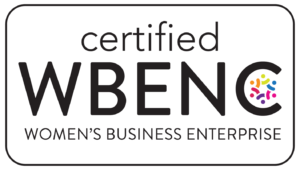 Becoming a WBENC-Certified WBE is the perfect moment for Camp Broadway to give a grateful shout-out to the many extraordinary women working in all areas of the theatre industry who have helped the company become a unique theatrical enterprise that is consumer-centric and future-focused. Twenty-five years ago, Camp Broadway was ahead of its time. Today, Camp Broadway is at the right place at the right time. Now that musical theatre is enjoying unprecedented popularity across every medium, the company will continue to produce innovative programs for audiences of all ages who seek positive immersive performing arts experiences that develop “character” in our nations’ artists and audiences. Gloria Ley (my mom) and Marya Len Yee, Esq., whose memory we honor with Marya’s Gift, Camp Broadway’s scholarship fund. They saw abilities in me that I didn’t see in myself. Dori Berinstein and Anne Strickland Squadron, who invested their time, talents and money to start a new kind of theatre company that produced audiences, not shows. And Colleen Jennings Roggensack—the first theatrical presenter in the country to say “YES, this work is important”. Melissa Caolo, whose unwavering commitment to excellence, artistic integrity and enlightened leadership is the gold standard for professionalism at the company and in the performing arts field. Kerry Dineen, Barb Domue, Jenine Campbell and Kathy Campbell are the heart, strength, smarts and spirit of the company. Their kindness and care for every customer is the essence of our brand. These ladies stand on the shoulders of the many talented professionals who we have worked or collaborated with in the past including: Janis J.H. Auster, Laurie Benoit, Laurie Brown, Lisa Jaeger, Mary Lisa Kinney, Caitlin Kellermeyer, Leslie Mazotta, Janess Messner, Nicole Miller, Lisa Poelle, Tiffany Redman, Hillary Reeves, Lexi Scholes, Roseanne Saraceno, Erin Spears, Lauren Sagnella, Jodi Simon Stewart, Marcy Sturiale and others who have helped produce or manage our programs. Kristine Bendul, Carol Bentley, Melinda Buckley, Lanene Charters, Sue Delano, Cindy Fernandez, Didi Gomez, Jessica Fallon Gordon, Erin Jean Jewel, Nissa Kahle, Canedy Knowles, Katie Palmer, Anna Raful, Holly Raye, Christine Riley, Michelle Robinson, Cindy Thole, Alexandra Schwartz, Carol Schuberg, Vanessa Spica and others who have shared their talents with campers and students at camp and our many workshops. Lakeisha Frith (Adrienne Arsht Center); Colleen Jennings-Roggensack, Desiree Ong and Melissa Vuletich (ASU Gammage); Yolande Spears (Bushnell Performing Arts Center); Nicole Stickeler (David A. Straz Center); Sarah DuBignon (The Fox Theatre); Janine Fawcett and Sarah Ilinjanich (Lakeshore Academy of Fine Arts); Doren Fein, Ana Flores, Kaye Lenox and Jennifer Martinez (Las Casas Foundation); Karen Wilson (Kings Center); Janet Shelley (Marion County Center for Arts); Karen Wright (Music Hall Center for the Arts); Alice Roberts (Orpheum Theatre); Stacy Koonce (Peace Center); Tracy Edmunds (Pittsburgh Cultural Trust); Cynthia Goldsmith (Providence Performing Arts Center); Jo Costanzo (Rialto Center for the Arts); Jennifer Fitzery and Holly Grant (Shea’s Buffalo); Rebecca Boyd and Candy Schneider (The Smith Center); Karen Longacre, Amanda Scott and Ashley Williams (Wilson Center Artist Series); Julienne Penza-Boone and Marissa Russo (West Hampton Beach Performing Arts Center), as well as Charlotte Saint Martin and Rachel Reiner (The Broadway League), Carol Chiavetta (Dodger Productions); Karen Freidus (Givenik); Anne Swanson (New York Pops) and others who have presented our programs on world class stages around the country. Sophia Condon, Michaela DeJoseph, Rachel Farr, Sarah Hutton, Laura Ley Carlson, Katie Ley Wingler, Susanna McCollum, Katie Powers, Sunny Naughton, Brock Looser, Nicolette Shin, Hannah Spacone and Emily Loewus who started as campers and grew up to be valued members of our team in the office and in the rehearsal studios. Dawn Brolin and Anne Ketelhut (Powerful Accounting), Maryann Mueller (RPS Bollinger Sports and Leisure) and Sada Sheldon, Esq. who help keep the company focused on doing well and doing good. Camarin Wanamaker and Rebekah Stacy (Active Network), Sarah Jane Arnegger (Playbill Inc.), Fran Morris Rosman (Ella Fitzgerald Charitable Foundation), and Tara Lynn Wagner who help make us smarter every day. With sincere thanks to all these magnificent women of the theatre for helping to make Camp Broadway an enterprise that is kind, collaborative and committed to making a positive impact on our customers, our community and the industry we love. P.S. Camp Broadway has also worked with many talented men over the years who have contributed greatly to the success of our company and programs. We look forward to the celebrating them in the future. CAMP BROADWAY® LLC was founded in 1996 and is recognized as Broadway’s “original” summer camp. The company’s mission is to make theatre arts an accessible and relevant way for creative children to build confidence, hone presentation skills, and discover their unique talents at every stage of their lives. Camp Broadway is now a respected industry leader in audience engagement and a trusted source for parents and teachers seeking quality year-round enrichment programs, experiential events and educational workshops.